1. Cut the sponge cake horizontally into 3 pieces. 2. Blend the cream cheese and vanilla ice cream thoroughly. 3. Divide it into 2 portions. 4. Place one portion of the cake and top it with a layer of the cheese and ice cream mixture. 5. 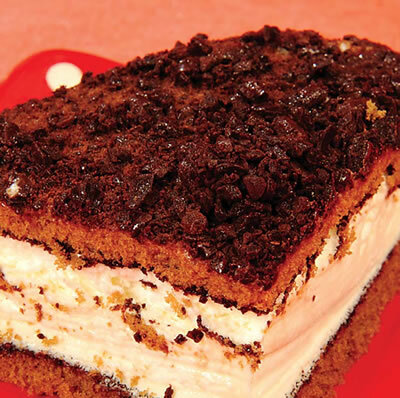 Add one portion of the cake on top and then spread cream cheese – ice cream. 6. Top this with the sponge cake and spread the chocolate flakes on top. 7. Keep this in the fridge till the ice cream is set. 8. To serve, cut into pieces and serve chilled. Feel free to comment or share your thoughts on this Triple Layered Chocolate Dessert Recipe from Awesome Cuisine.